After their father's death, two unhinged siblings reunite with Amy, their movie-loving sister who has Down syndrome. Together, they careen down the Great American Long Island Expressway, navigating strip malls, traffic jams and some serious (and not-so-serious) family drama. An unexpected turn reveals the moment that changed their lives...and the fact that Amy may be the only one who knows her own mind. Production - Carlotta Festival of New Plays, New Haven, CT.
Ms. Ferrentino possesses a muscular empathy which seeks to enter the minds of people for whom life is often a struggle of heroic proportions. 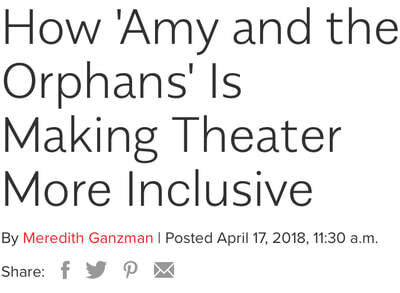 It was Ms. Ferrentino who insisted that an actress with Down syndrome be cast as Amy in her latest play. Insightful. Defiant. Remarkable...heart broken resonance. Amy and the Orphans features enough hilarious one-liners to fuel a Neil Simon comedy. A riotous, audacious blend of pathos and humor. There's a powerful beating heart in Lindsey Ferrentino's writing. A play that boasts a rich, aching humanity. The writer is savvy about building her characters. She cunningly inserts little traits shared by the parents and their offspring that credibly dovetail to touching effect. 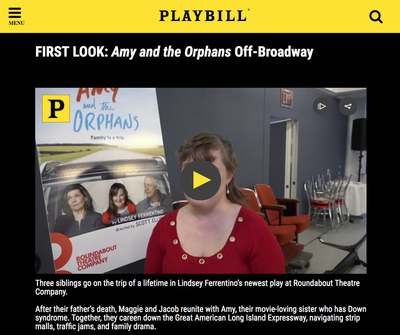 Amy and the Orphans takes audiences on a swift trip to greater awareness. Smoothly paced. Funny and thoughtful. 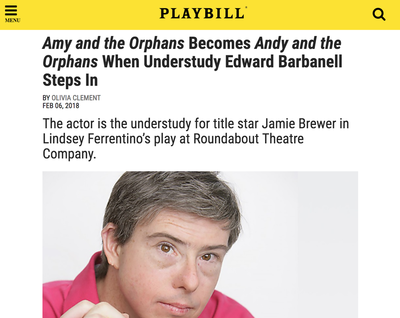 Dedicating this play to her late aunt, Amy Jacobs, who had Down syndrome, Ferrentino notes that she “is missed for who she was and for who she could have been.” Amy and the Orphans proves to be an endearing new play that wisely reminds us of that all-important dictum: to treat others with as much respect and consideration as we’d like ourselves to be treated. 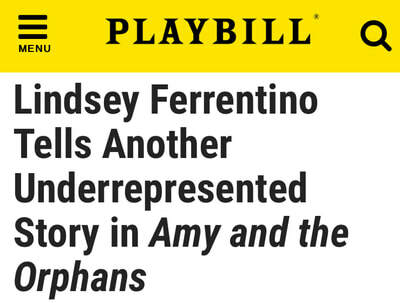 Much more significant is that [Lindsey Ferrentino] lifts the play from its sitcom comfort level by turning Amy into the edgiest character on stage. Ferrentino’s play rolls along so effortlessly. The playwright has a bomb up her sleeve, and when she decides to detonate it, much deeper levels of fear and apprehension are immediately revealed. Ferrentino achieves something equally remarkable. She has written a play about abuse in which there are only survivors and no obvious villains. An astonishing play that is likely to alter your preconceptions. This touching drama questions the bonds of family and limits of love. 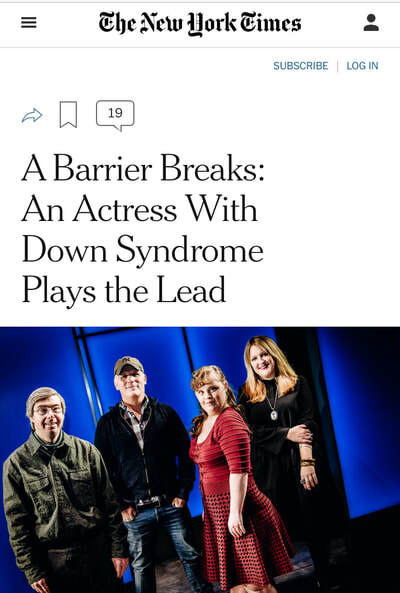 Hopefully theater artists and producers will recognize the ground Brewer and Ferrentino have broken and press on, creating more opportunities for actors with disabilities to have the moments in the sun they truly deserve.